Seems a little early for the holidays, but did you know that fruitcake can be made months in advance? Up to about two months, which is especially handy for the busy Christmas season. Besides adding delicious flavour to this fruitcake recipe, the rum acts as a natural preservative and pairs perfectly with coconut – hence my decision to top it with coconut cream cheese icing. 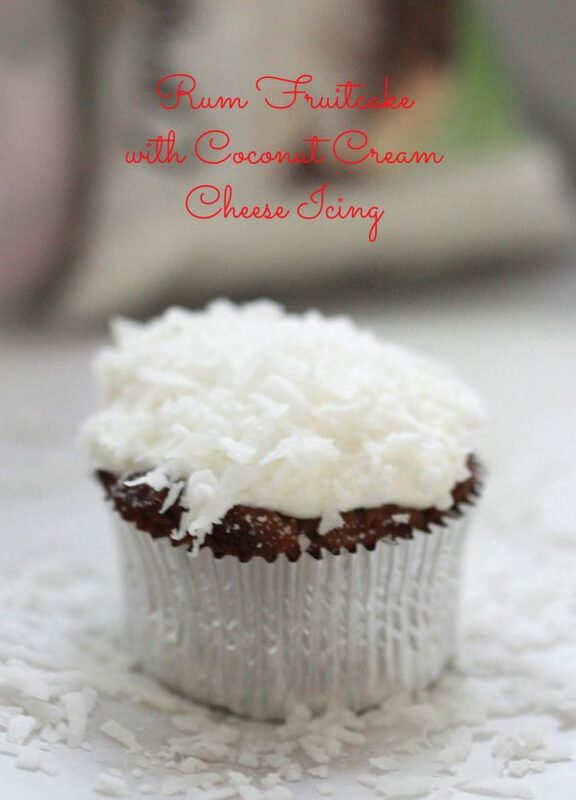 … or as cupcakes topped with coconut flakes. A few fondant holly leaves and berries add a pretty splash of holiday color, and are really so easy to make! I used this cutter (smallest one) for the holly leaves, and just rolled out small balls of red fondant for the berries. 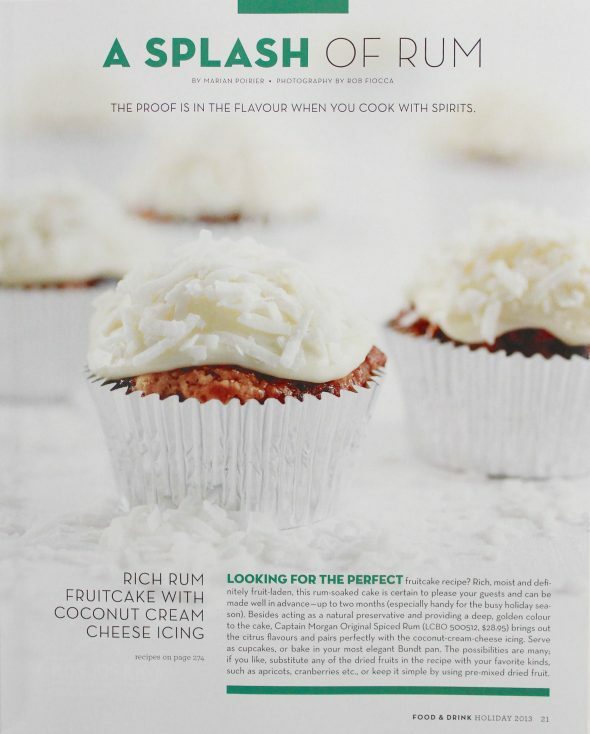 I’m thrilled to have been asked to make the recipe for the LCBO’s Food & Drink magazine! 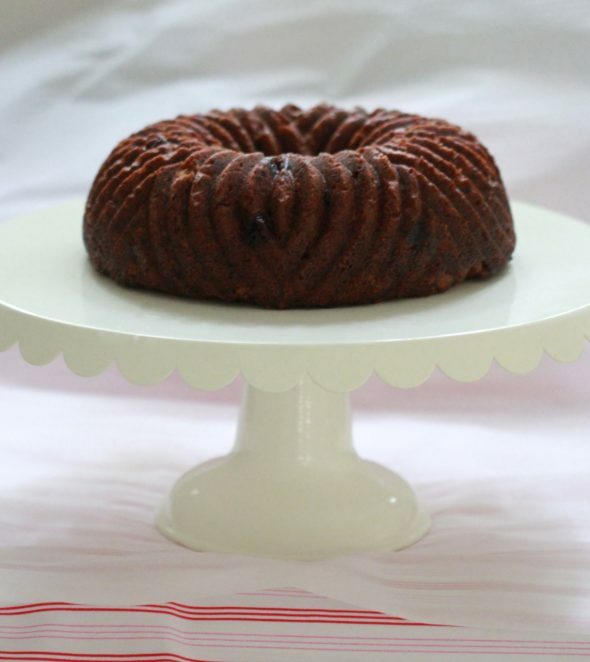 Their holiday issue is out now, and you can find my rum fruitcake on page 21. (Happy dance over here!). 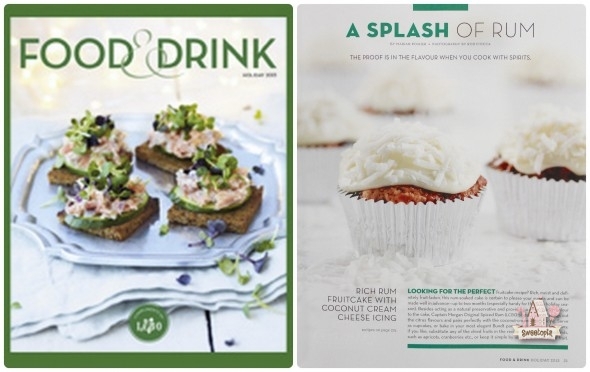 If you haven’t seen Food & Drink, it’s a magazine dedicated to the art of entertaining, including the latest recipes and information on wine, spirits and beer. It’s a real treat for the eyes and is so inspiring – no matter what the season, it always manages to get me in the mood for trying new sweet and savoury dishes. The magazine is only available in Canada, so if you live elsewhere, below are the recipes for you. Hope you have fun baking, decorating and eating this fruitcake as well! Making this recipe weeks before serving allows the rum flavor to intensify and can be a big time saver during the busy holiday season! If desired, unwrap occasionally and brush with more rum. Yield: Makes 24 cupcakes or one 9-inch (23-cm) Bundt cake. In a food processor, pulse together raisins, currants, prunes, candied fruit and citrus peel until a smooth, thick paste forms. Transfer to a large bowl and stir in 2 cups (500 mL) of the rum. Cover tightly and keep in a cool, dark spot, stirring once a day, for at least 2 days, or for up to 2 months. In the bowl of an electric mixer, using the paddle attachment, beat butter and brown sugar until smooth. Beat in eggs, 1 at a time. Mix in coconut and almond extract. In a separate bowl, whisk together flour, almonds, baking powder, cinnamon, cloves, nutmeg and salt; slowly stir into butter mixture until incorporated. Stir in raisin mixture and glacé cherries. For cupcakes, line cupcake pans with liners, and using a ¼-cup (60-mL) measuring cup (or a #16 / 2 oz ice cream scoop), scoop the fruitcake batter into each liner. Bake for 20 to 25 minutes, or until a toothpick comes out clean. For a Bundt cake, spray the Bundt cake pan with a nonstick cooking spray and pour the batter into the pan. Use a plastic spatula to evenly spread out the top of the batter. Bake for 40 to 50 minutes, or until a toothpick comes out clean. Using a skewer, poke holes in the top of your cupcakes or cake and brush with rum. Let cool in the pan for 24 hours. 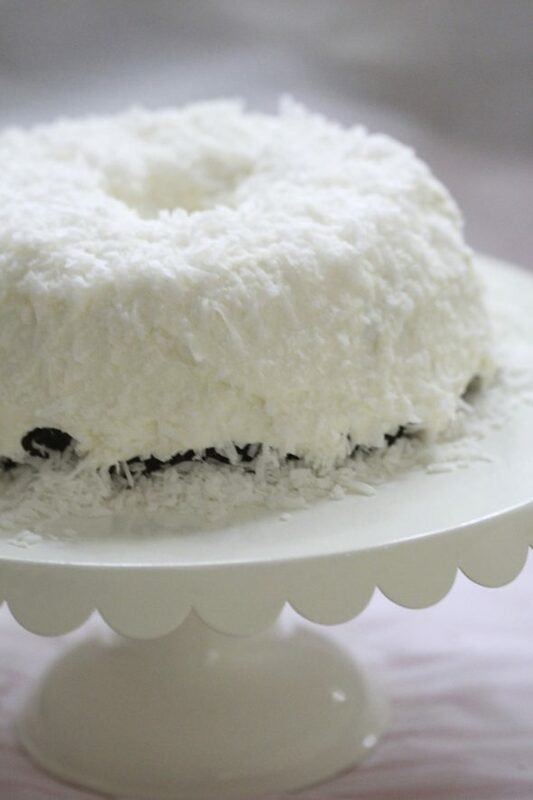 Dust with icing sugar or top with luscious coconut cream cheese icing and sweetened coconut flakes. 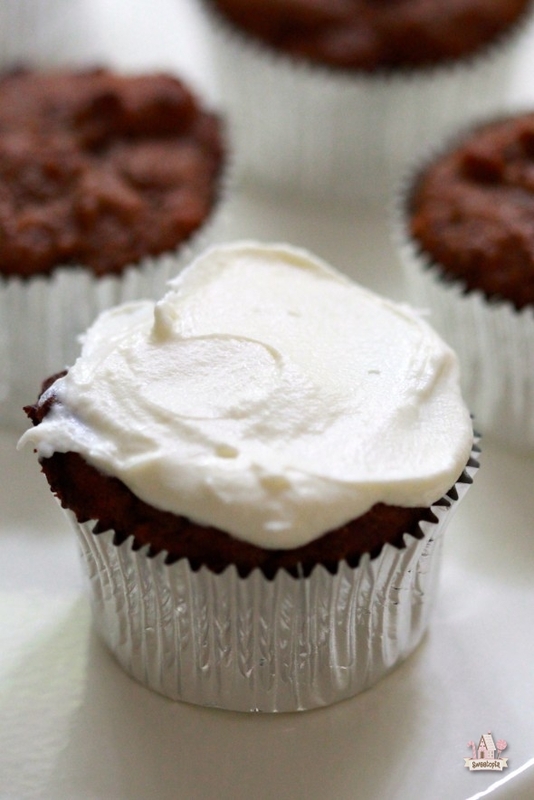 Add a little more coconut extract if you’d like a more intense coconut flavor to your icing. And here’s a little secret: if you’d like your icing to look whiter for the snowy holiday season, add a few drops of white food colouring. Yield: Makes enough for 24 cupcakes or one 9-inch (23-cm) Bundt cake. Cream the cream cheese, butter, coconut extract and vanilla extract in the bowl of an electric mixer fitted with the paddle attachment. Slowly add the icing sugar and beat until smooth. 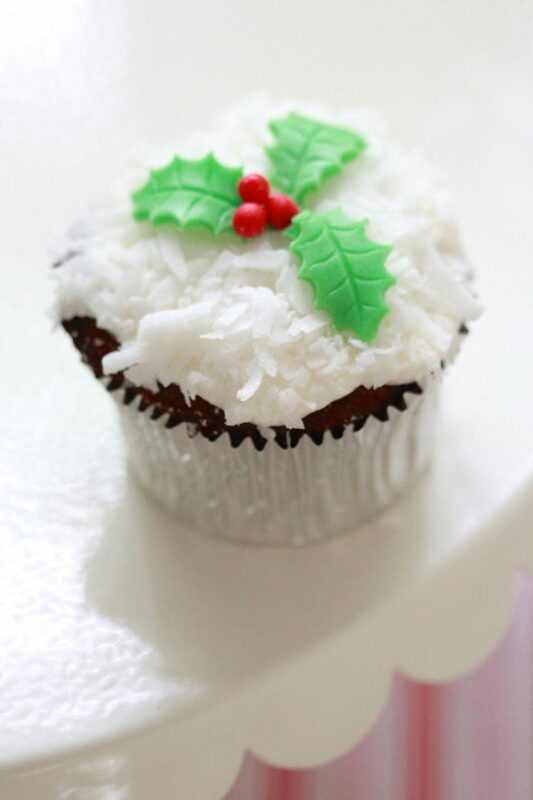 Garnish cupcakes or cake and immediately sprinkle desired amount of coconut flakes on top. Yummy, rum makes life so much better. This looks fun to make but I think I must test it out first for scientific purposes (of course). do you freeze it or just leave it out if you make it in advance and also what do you wrap it with? Hi Alexandra, I leave it in a cool, dry place wrapped tightly (and generously), with saran wrap. I must try to make this fruitcake. It looks very interesting and fun. That looks SO good and SO yummy! Wishing you a lovely start into the week. Thanks for posting such a sweet blogpost today. 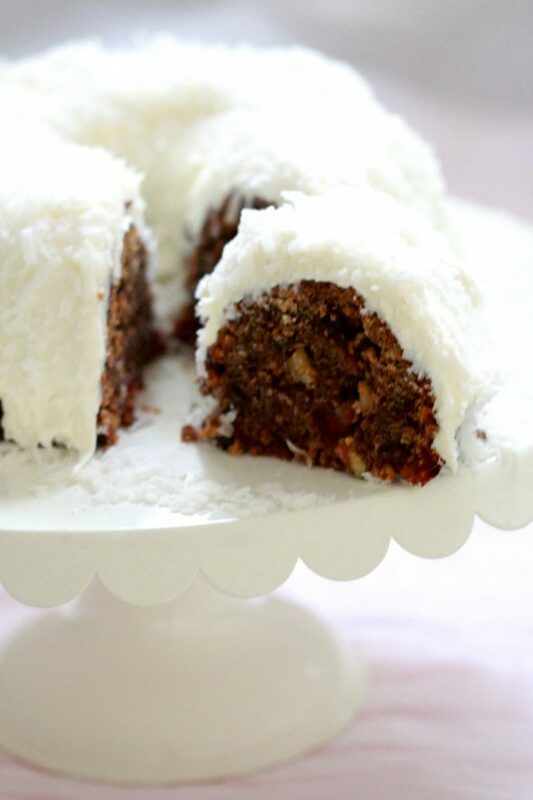 LOVE that coconut icing! SO pretty! I agree with Heather! This may change EVERYONE’S mind about fruit cake!!! it looks lovely! Heck, yes! I’m a fruitcake fan through and through. And an avid coconut lover, too. Can’t wait to try this, Marian! Oh my word!! I cannot get over how good these look! Congratulations Marian! How awesome and well deserved. The recipe looks killer and I love the icing! Hi Shona, I would put the frosting on close to serving time (about 2 weeks), and store leftovers in the fridge. I haven’t tried a lot of fruitcakes, mainly just because of the bad reputation they have. Is it a moist cake? or is it dry? Quick question on making this…. I have made the candied fruit peels and have them taking a rum bath. Do you think it is worth the effort and time to making my own candied fruit or should I just by them at the store? Will I be able to taste the candied fruit or will the rum mask the flavor? If you can, I would buy the individual ingredients. The candied fruit will make it a bit sweeter… still good, but I like the first option better. Anything with rum and cake in the title is a sure hit with me! How do you make your own candied fruit. What what is a rum bath like Andrea was talking about? Hi Rebecca, I actually bought the candied fruit and didn’t make it on my own. If you can’t find it, you can just add more (1/2 cup) of your favorite dried fruits. The rum bath is where you soak the dried fruit in the rum. (#1 in the recipe instructions). That has gotta be the most tempting fruitcake I have every seen! I absolutely love your site and your recipes!! I am baking the rum fruitcakes for Christmas and just wanted to know how many days in advance can I bake them, and in such case, once baked, if I have to keep pouring rum on top of them every day. Thanks in advance, and happy holidays!! You can make them months ahead, so definitely can make them right away. You could make them more moist and “rummy” by pouring rum on top every day until you’re ready to serve, but I just did what the recipe says and not more, and that was perfect for us. Taste them when you’re done and see what you think! Hope that helps and happy holidays! Hi Christine, yes you can. 🙂 Have fun baking!